Quality: Very Good (Better than Amazon release). Western starring Audie Murphy as a cavalry captain who not only has to deal with an Apache uprising, but also a mutiny among his own men. 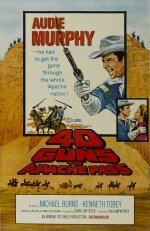 Audie Murphy made his penultimate screen appearance in this low-budget western from B-movie specialist William Witney. Although it's briskly and efficiently made, it's never anything more than a routine cavalry adventure, with Murphy initially leading his bluecoats into brutal action against the warring Apache, only to discover that the tribe isn't his most pressing problem. Murphy may be the star, but the more interesting performances come from Kenneth Tobey (as the greedy corporal who sells rifles to the enemy) and Michael Keep, who manages to avoid the usual clichés in his portrayal of the legendary Cochise.